Qatar Airways marked the successful conclusion of this year’s emergency exercise, which has been dubbed ‘Delta Oryx 2017’. The emergency simulation consisted of a crash site in the sea adjacent to Hamad International Airport (HIA). The planned emergency simulation is an annual procedure at Qatar Airways, initiated as a means of testing emergency facilities, in addition to ensuring that our staff are well-prepared to handle and deal with the situation in the most effective manner. 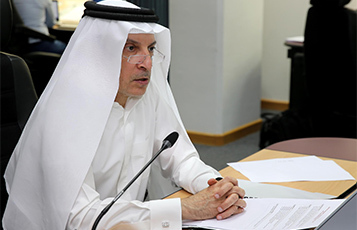 With the coordination of more than 28 government agencies, stakeholders and partners, including Hamad International Airport, Qatar Coastguard, Internal Security Forces, Qatar Navy and the Qatar Emiri Air Force. ‘Delta Oryx 2017’ incorporated the use of a 30-seater mock aircraft, two Qatar Airways aircraft chutes, 170 volunteer passengers, 60 volunteer family members and friends, 39 dummies to display casualties, 40 ambulance response vehicles, three military helicopters, five airport safety and security vehicles and 10 Mowasalat buses. The extensive scale and complexity of this year’s emergency simulation was carefully crafted to examine and test any weakness in the airline’s emergency facilities and Local Emergency Response Plan. The exercise also tested specialised forces’ arrangements for rescue at sea, including the Coastguard, Internal Security Forces, Qatar Navy and Qatar Emiri Air Force. The simulation seamlessly interfaced with HIA’s annual emergency exercise and Hamad Medical Corporation’s emergency exercise activating all public hospitals and selected primary health care facilities in Qatar. In accordance with the requirements established by the International Civil Aviation Organisation (ICAO), airports are required to hold an emergency exercise every two years to fulfill their licensing requirements. As an airport directly located beside the sea, HIA is also required by ICAO international regulations to ensure adequate emergency procedures are in place in the event that occupants are to be rescued from an aircraft that has crashed into the sea. 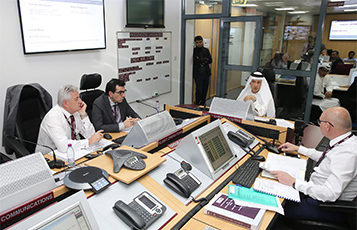 Qatar Airways’ emergency management programme includes a Corporate Emergency Response Plan, an automated Crisis Management and Casualty Tracking System, a dedicated Group Emergency Control Centre, Group Emergency Management Team, Emergency Telephone Enquiry Centre, Special Assistance Centre, an Emergency Website, a Media Enquiry Centre, a Media Operations Centre and a Deployed Response Group that includes Special Assistance Team Members (Humanitarian Support Programme). If activated, the Deployed Response Group would be dispatched to the emergency site using a dedicated relief aircraft to provide additional support to local staff, responding agencies and authorities on the ground.